I was totally blown away by Downburst. I loved it! And can't wait for the next book in the series. This book kept me on my toes as the first person narration only allowed limited glimpses at what was going on. Kit is a runaway who survives by being a messenger for a forgery artist. She finds herself again on the run when the forgery ring is busted by cops. She has no money, no id, and no idea what she's going to do. I wasn't sure of the time period - either it is modern day in a crime ridden area or it is a bit of a dystopian society. While hiding out in the train yard, Kit spies her last drop, Aura, who happens to have an uncanny resemblance to herself. The fate of this girl isn't any better than Kit's as her throat is slit. Grabbing the girl's wallet, she unwittingly gets wrapped up in the life of Aura. When she arrived at the camp (by dubious means), I was not sure if it was a terrorist training cell or a Hunger Games-like survival boot camp. Robison does a wonderful job of revealing just enough information to keep the story moving forward, but plenty of red herrings or misdirections to keep the story exciting and the reader guessing. You know something isn't quite right in this camp, at the same time you begin piecing together that it isn't all bad. Surely the threats of skinning spies alive is just a joke, right? For Kit's sake you hope so. It is hidden gems like Downburst that makes me love reviewing independent and small press published books. I don't know why more people aren't talking about this book. Go read it! 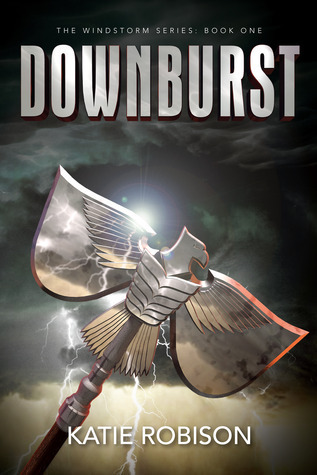 And, now you could win a copy of Downburst. Katie is offering an ebook copy to one lucky winner. It's open internationally! Nice trailer! The pictures, text went together really well. And the trailer looks like a movie trailer! Much better than a lot of book trailers that I've seen. Love the trailer - I agree - looks like a movie! Ohhh I do not think it looks like a movie trailer BUT it is a high end book trailer. I love the pace of the stills, the ambient sounds combined with the storm, the shoes tapping on concrete, its complexity is stellar! Seriously very nice trailer! Interesting book and wonderful trailer. I will have to get this book. Thanks for sharing.